Nostalgia In Miniature Workshops: Catching Up...on a Lovely Day!!! We've been talking about it for long enough, so you'll all know that we attended the Thame Dolls House and Miniatures Fair last Saturday, wearing both our KT Miniatures, Coombe Crafts AND Nostalgia in Miniatures hats!! Felicity and Ron - who organized a most successful and enjoyable day, very kindly made available a table for us to display 'On a Cold and Frost Morning...after the night before' donated by us for a Sealed Bid Auction in aid of Breast Cancer Campaign. The winning bid by Michelle Rice was an amazing and generous £300.00 ...... so a huge 'thank you' to Michelle, to everyone else who also bid and to Janet Kirkwood, Editor of Dolls House and Miniature Scene Magazine who commissioned it as a 'How To' project in the first place and promoted the auction. Our thanks to wonderful helpers from MTM - the Thame Club who also kept an eye on it (as it whizzed round happily on its little turntable) while hosting the Tombola, Raffle and Sales Table too. It looks like the final total of monies raised for the charity is going to be terrific. The fair itself was such a triumph - wall to wall outstanding U.K. artisans of such variety and standard. It does mean that if you're a standholder, and are busy (yes we were, thanks) it's hard to have a browse or say hello to friends - we needn't have worried - so many of our lovely Workshop ladies came to the fair and stopped to have a chat with both us and each other. It was just lovely, and we both enjoyed and appreciated the feedback, new ideas and giggles at past exploits and planning for new ones!! It was a very special day indeed. Jennie has a great sense of humour - and talent - she's incorporated Robin's dolls into her 1/24th projects. Now she just needs to make some marrows to go with the Marrow Plant Kit by Georgina Steed that she's made so well!! 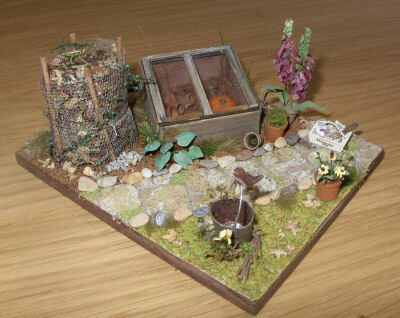 Karen's 'Down the Little Garden Path' project - this is lovely - the foxgloves add a unique individual touch. It looks like a golden pumpkin in the cold frame and her pots are filled with plants. Melanie's very accomplished Christmas workshop project - she's finished off the jumper and longjohns with tiny buttons and added a bag of coal to the coal bunker corner and is raring to go with lots of new ideas for the future we're told!! As you can see from these photographs, each participant starts with the same kit and instructions on the day, but then add their own inspirtional touches, tweak and invent....for us this is what our workshops are all about. We use old techniques with a twist, our own new, individual and tested ones and really simple ordinary materials to show that with a little miniature imagination - whether you are a novice or experienced - anyone can do it!! We're looking forward to 'The Little Old Garden Shed' at Waterperry Gardens on March 25th - the last in the 'Little Old Garden' series for now, and 'The Little Old Vintage Hall' on April 29th here in Thame at the Girl Guide Headquarters. Please note that we only have one more space available for the April workshop now. If you would like to take up that space, please get in touch with either of us asap.